I've seen some threads on the forum regarding the MMK pickups and am looking for some details if anyone has info. "2 Magnaflux OFC (Oxygen free copper)" and I always wondered what they sounded like. I also had posted a question on OFC pickups in an earlier thread and there where response to the defintion of what Oxygen free means, but never really got a vibe on what the PUPS sounded like. So now that I have a 350MA (which I thought was going to have replacement EMG's in it) and was suprised to see the PUPS are original. I've heard MMK 45's mentioned quite a bit on the forums and they seem very popular in a lot of MATS, but after taking the PUPS off the 350 I see that they are MMK 75's. This is the first I've ever heard of MMK 75's. Anyone measure the outputs of the 75's? They sound very good, and I think I like them more than expected (I really am not a fan of the original PUPS in my x300 so my expectations on Westone pickups have been low). These PUPS are pretty impressive. I had original planned on dropping a seymour duncan set in the 350, but I think I'm going keep these for awhile since they sound pretty strong but warm. So at the end of the day - what's the scoop on the MMK 75's? who's got experience/opinions on them? I've got one that I bought from a bloke in New Zealand who broke up a Pantera of some sort; it's currently in Newcastle-upon-Tyne and I hope to retrieve it later on this year as I have an idea to either whack it into my MX, or swap it for another sort of MMK to whack into the hole - I can't remember the readings now, but they weren't outrageously high or anything.... I recall that they were a 'full' sounding pickup, though. Well,i for one am a BIG fan of the 75s. You often find them in the higher end Mat guitars for some reason like PE-120 Lim,TAs asf. I run the stock MMK75s in my TA-70(bridge) and have tried them in other guitars as well. Long story short the MMK75 IMO are very well built PAFs. They measure in at just short of 8k no matter if they´re bridge or neck. I thin the 75s are one of matsumokus hidden treasures really-they are that good. Then again i´ve been developing along the lines of either P90s or PAF style pups in later yrs. One feature of pups in that range,again IMO,is that they let more of the wood through in the tone and so does the 75 too. 61s in turn are basicaly your overwound 75s. I dunno tho...i like the 75s better,but that´s just me i guess. Agreed, they are a sweet sounding pup. A lot due to the alnico II magnets. Not as harsh as alnico 5. My Prestige 150 has MMK 75's. The catalog calls them 'Super Twin 750' pickups. A cool tidbit I discovered, is the PEQ tone controls gradually coil tap the pickups when you turn them clockwise. Pretty ingenious! Anyway, with the earlier Westones, the actual MMK model number is sometimes found within Westone's pickup name, such as the Thunder III's HF530 is an MMK 53. But you guys probably already know this already. Later. cnevins wrote: the PEQ tone controls gradually coil tap the pickups when you turn them clockwise. 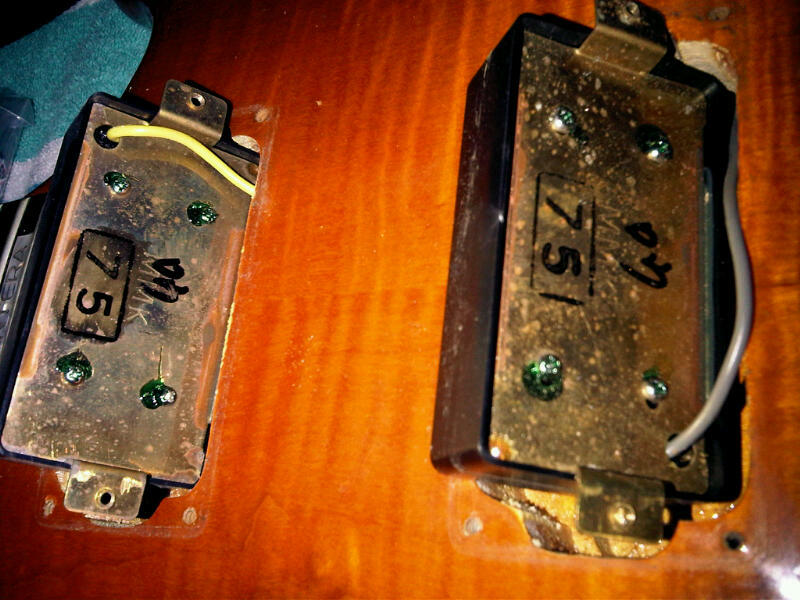 No they don't - they switch the internal wiring of the two humbucker coils from series to parallel. I swapped the MMK75 of my Rainbow 1 for a pair of Gibson 490/498 (which are supposed to be close to the Classic 57). The Rainbow1 sounded very différent with those Gibson pups, more precise, clearer whith upper midrange response but the guitar have lost the richer warm and (a bit)nasal tone she had with the MMk75 (or twin 750) The MMK75 have a stronger personality IMO.I'll put them back. Geez criss, way to pull a Lazarus on a 6 year old thread! But happy to hear all is once again right in the Rainbow universe. Everything is perfect in the Rainbow's kingdom, laissons Lazare se rendormir.